Wellington, FL – March 9, 2011 – The Tenth Annual Challenge of the Americas competition and gala is set for this Saturday, March 12, 2011 at the International Polo Club Palm Beach in Wellington, FL. Beginning at 5:15 pm at the Nespresso Lodge, the 2011 Challenge of the Americas (COTA) will be presented by International Polo Club Palm Beach (IPC) and will benefit Play for P.I.N.K., a partner of The Breast Cancer Research Foundation. This equestrian evening features musical team quadrilles performed by the “who’s who” of top riders in the United States, Canada, Latin America, and Europe. COTA will be an exciting evening to benefit an incredible cause. In addition to the team quadrille dressage challenge the evening’s events will feature a special polo match. COTA Chairmen Mary Ross, along with Georgette Escobar and the Challenge Committee are proud to present an International Musical Grand Prix Dressage Quadrille Team Challenge and Polo Extravaganza. The Challenge Gala, an elegant evening of dinner and dancing, will get underway immediately following the “The Challenge of the Americas” competition. An awards presentation will be featured and guests will have the chance to meet and socialize with riders and judges. Each team is made up of six horses and riders that will perform intricate musical quadrilles on the main field at IPC. This year’s United States team, sponsored by Purina Mills, will be made up of Betsy Steiner, George Williams, Pamela Goodrich, Bill Warren, Jim Koford, and John Zopatti. The team’s choreography, music and coaching is all being handled by Terry Ciotti-Gallo. Team International The Seley Parker Group of Merrill Lynch is composed of Marco Bernal, Juan Matute, Yvonne Losos de Muniz, Lou Denizard, Heather Bender and new rider to this year’s Challenge, Jessica McTaggart. Team International is co-coached by Erin Swaney and Ruth Hogan Poulsen. Swaney will also handle the choreography, while Hogan Poulsen of Freestyles from A to C will handle the music. Team Can/America is sponsored once again by SSG Gloves, and will be composed of Devon Kane, Liz Austin, Jon Costin, Tine Zinglerson, along with two new team members for this year JJ Tate and Susanne Dutt-Roth. Karen Robinson from Applause Dressage will handle the music for Team Can/America, while choreography and coaching will be handled by Challenge of the Americas native Shannon Dueck. 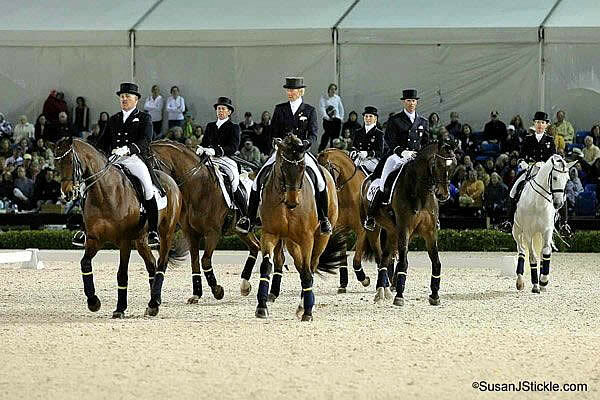 Don’t miss this spectacular evening of world-class dressage performances. Wine and dine while mingling with the best of the best. Come join us for an evening of fun and excitement. As the event is quickly approaching, some media creditials are still available. Please contact Phelps Media Group at pmginfo@phelpsmediagroup.com for more information. WHAT: An International Musical Grand Prix Dressage Quadrille Team Challenge and Polo Extravaganza. The Challenge Gala, an elegant evening of dinner and dancing, will get underway immediately following the “The Challenge of the Americas” competition. An awards presentation will be featured and guests will have the chance to meet and socialize with riders and judges in the new Nespresso Lodge. EVENT SPONSORS: USDF; Cunningham & Cunningham Livestock Insurance; Arenus, MatchnRide.com, Back on Track, Wellington Classic Dressage, Palm Beach Equine Clinic, Red Barn Feed & Supply, The Tackeria, Ecogold, Bethesda Women’s Health Center, Dover Saddlery, King Ferry Winery, Jamaica Tent and Sunbelt Rentals. BENEFICIARY: Challenge of the Americas benefits Play for P.I.N.K and The Breast Cancer Research Foundation. ADMISSION: General Admission tickets can be purchased at the gate on the evening of the event for a $20 donation. CONTACT: To make reservations for the Challenge Gala & VIP Box Seating, contact Mary Ross at 561-852-2591.